Here's the final Valentine cards for the kids at the charity. 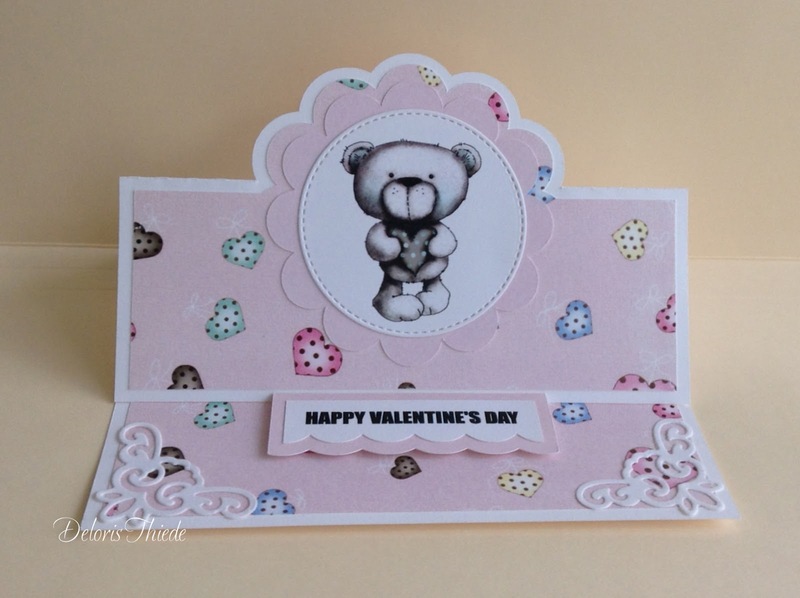 I used a darling bear image from a new digi kit I purchased recently called Winston Bear from Polkadoodles. Print papers and flowers are also included in the kit. Cut out the main card pieces with my Cameo. Cut out the image on the top card with stitched circle dies from Cottage Cutz and Spellbinders circle die for the bottom image. Photo corners on top card are cut out with Sizzix die and photo corners on bottom card were cut out with EK Success punch. Such beautiful cards, love both of them. And doing the bears in greys so clever. So cute and love how you have done him in grey, work so well with the pink. These are so pretty Deloris, such cute images and lovely pastel papers - fabulous Valentine cards. I have to agree with everyone else - these cards are adorable! Thanks for joining our first challenge of 2017 - good luck. Remember to join us for our week-long Birthday bash event that starts later today! Well Winston is adorable and you've created a beautiful card with him! Thanks so much for joining in our challenge at Catch The Bug! You always find the sweetest images and such pretty paper. What a wonderful kit.! Goodness...how many teams are you on.